The generic name Diospyros comes from the ancient Greek words dios (διός) and pyros (πυρος). In context, this means more or less "divine fruit" or "divine food", though its literal meaning is more like "wheat of Zeus". The interpretation of Diospyros is sufficiently confusing to have given rise to some curious and inappropriate interpretations such as "God's pear" and "Jove's fire". The name Diospyros was originally applied to the Caucasian persimmon (D. lotus). The genus is a large one and the number of species has been estimated variously, depending on the date of the source. The Royal Botanic Gardens, Kew, list has over 1000 entries, including synonyms and items of low confidence. Over 700 species are marked as being assigned with high confidence. 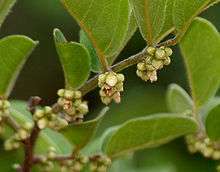 The leaves of Diospyros blancoi have been shown to contain isoarborinol methyl ether (also called cylindrin) and fatty esters of α- and β-amyrin. Both isoarborinol methyl ether and the amyrin mixture demonstrated antimicrobial activity against Escherichia coli, Pseudomonas aeruginosa, Candida albicans, Staphylococcus aureus, and Trichophyton interdigitale. Anti-inflammatory and analgesic properties have also been shown for the isolated amyrin mixture. Diospyros species are important and conspicuous trees in many of their native ecosystems, such as lowland dry forests of the former Maui Nui in Hawaii, Caspian Hyrcanian mixed forests, Kathiarbar-Gir dry deciduous forests, Louisiade Archipelago rain forests, Madagascar lowland forests, Narmada Valley dry deciduous forests, New Guinea mangroves or South Western Ghats montane rain forests. The green fruits are rich in tannins and thus avoided by most herbivores; when ripe they are eagerly eaten by many animals however, such as the rare Aders' duiker (Cephalophus adersi). An economically significant plant pathogen infecting many Diospyros species – D. hispida, Kaki persimmon (D. kaki), Date-plum (D. lotus), Texas persimmon (D. texana), Coromandel ebony (D. melanoxylon) and probably others – is the sac fungus Pseudocercospora kaki, which causes a leaf spot disease. 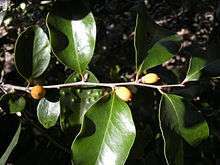 The genus includes several plants of commercial importance, either for their edible fruit (persimmons) or for their timber (ebony). The latter are divided into two groups in trade: the pure black ebony (notably from D. ebenum, but also several other species), and the striped ebony or Calamander wood (from D. celebica, D. mun and others). 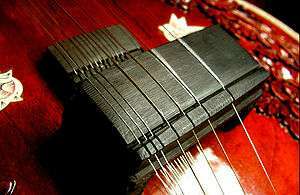 Most species in the genus produce little to none of this black ebony-type wood; their hard timber (e.g. 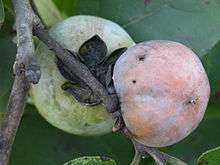 of American persimmon, D. virginiana) may still be used on a more limited basis. 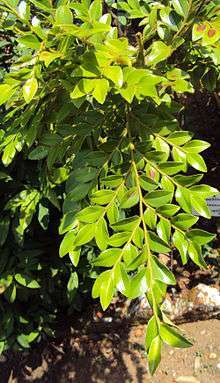 Leaves of the Coromandel ebony (D. melanoxylon) are used to roll South Asian beedi cigarettes. Several species are used in herbalism, and D. leucomelas yields the versatile medical compound betulinic acid. 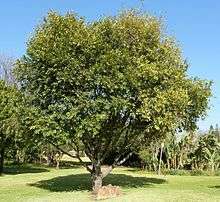 Extracts from Diospyros plants have also been proposed as novel anti-viral treatment. Though bees do not play a key role as pollinators, in plantations Diospyros may be of some use as honey plants. D. mollis, locally known as mặc nưa, is used in Vietnam to dye the famous black lãnh Mỹ A silk of Tân Châu district. The reverence of these trees in their native range is reflected by their use as floral emblems. In Indonesia, D. celebica (Makassar ebony, known locally as Eboni) is the provincial tree of Central Sulawesi, while Ajan kelicung (D. macrophylla) is that of West Nusa Tenggara. 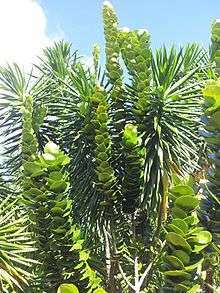 The emblem of the Japanese island of Ishigaki is the Yaeyama kokutan (D. ferrea). 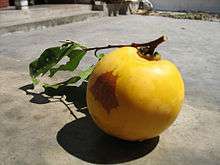 The Gold apple (D. decandra), called "Trái thị" in Vietnamese, is a tree in the Tấm Cám fable. 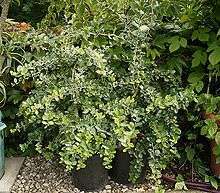 It is also the provincial tree of Chanthaburi as well as Nakhon Pathom Provinces in Thailand, while the Black-and-white ebony (D. malabarica) is that of Ang Thong Province. The name of the Thai district Amphoe Tha Tako, literally means "District of the Diospyros pier", the latter being a popular local gathering spot. Diospyros australis (R.Br.) Hiern – Yellow persimmon, Black plum, "grey plum"
Diospyros ebenum J.Koenig ex Retz. – Ceylon ebony, India ebony, "Ebony"
Diospyros marmorata R.Parker – Marblewood ebony, "marblewood"
Diospyros mespiliformis Hochst. ex A.DC. – Jackalberry, "African ebony"
Diospyros nigra (J.F.Gmel.) Perrier – Black sapote, Chocolate pudding fruit, "Black persimmon"
Diospyros texana Scheele – Texas persimmon, Mexican persimmon, "Black persimmon"
Diospyros virginiana L. – American persimmon, Eastern persimmon, Common persimmon, Possumwood, "Simmon", "Sugar-plum"
1 2 "Genus: Diospyros L.". Germplasm Resources Information Network (GRIN) [Online Database]. United States Department of Agriculture Agricultural Research Service, Beltsville, Maryland. 28 Apr 1998. Retrieved 15 Sep 2016. ↑ Jaeger, Edmund Carroll (1959). A source-book of biological names and terms. Springfield, Ill: Thomas. ISBN 0-398-06179-3. ↑ Tice, John. H. "Essay on the Diospyros virginiana" Annual report / Missouri State Horticultural Society 1864. ↑ "Diospyros". The Plant List. Retrieved 3 February 2014. ↑ The Nature Conservancy – Hawaiʻi Operating Unit (March 2004). "Kānepuʻu Preserve Lānaʻi, Hawaiʻi Long-Range Management Plan Fiscal Years 2005–2010" (PDF). Hawaii Department of Land & Natural Resources Natural Area Partnership Program: 3. Retrieved 2009-04-09. Dressler, S.; Schmidt, M. & Zizka, G. (2014). [http://www.africanplants.senckenberg.de/root/index.php?submitForm=true&page_id=77&searchTextMenue=Diospyros&filterRegionIDs=6&filterRegionIDs=1&filterRegionIDs=2&filterRegionIDs=3&filterRegionIDs=5 "Diospyros"]. African plants – a Photo Guide. Frankfurt/Main: Forschungsinstitut Senckenberg. Wikimedia Commons has media related to Diospyros.